A career is more than a job. It’s a path toward more financial security, new experiences, and opportunities to grow as a person and professional. Life is good if you can get on the right career path. It’s a lot tougher when you can’t. Shawn Reid was on the wrong path. As a kid in New York City’s Coney Island, he’d been in and out of trouble. At the age of 20, he’d became a father earlier than he’d intended. Nineteen years later, his son—who is also his best friend—moved out of state. Shawn’s own father, who wasn’t around when he was growing up, had recently died along with both Shawn’s grandfathers. Shawn had also lost a job he’d held for 8 years, and was struggling to get by with two low-paying part-time jobs. 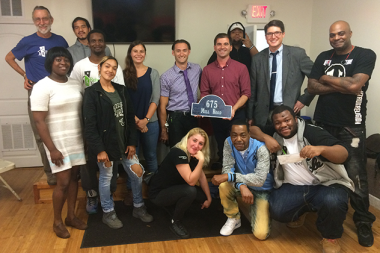 With that resolve, Shawn visited the offices of Workforce1, a service that connects New Yorkers with training and career opportunities. 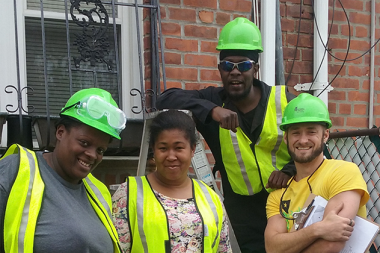 There, Shawn heard about Rebuilding Together New York City’s Workforce Training Program and how it could give him a chance to break into the construction field. It was a career path he’d always been interested in, but hadn’t been able to pursue on his own. Construction is booming in New York City. Union construction careers provide fair pay and benefits, steady work, and dependable raises. People wait in line for days to attend recruitment events for the apprenticeship positions that are the first step on a long-term career path in construction. 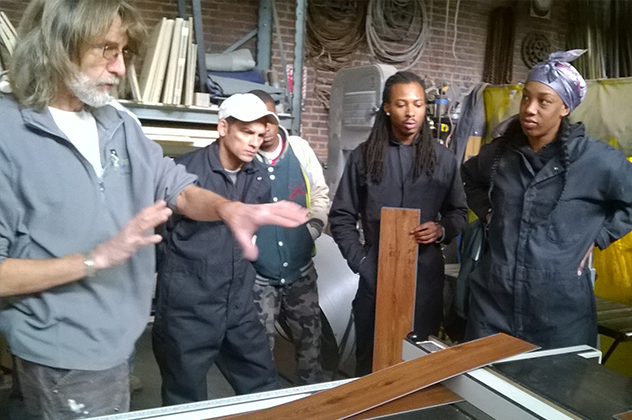 Because New York State has approved Rebuilding Together New York City as what’s called a direct entry provider, its program graduates get special access to these coveted apprenticeship programs. 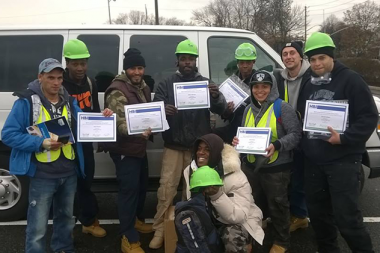 Rebuilding Together New York City’s Workforce Training Program is different than other direct entry programs because its participants spend three weeks in the field working on real construction sites. 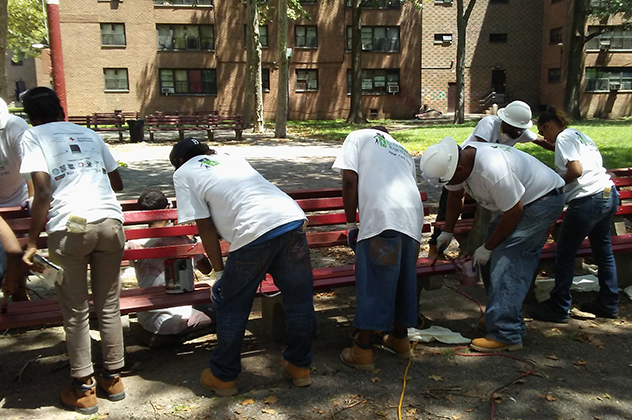 What the program participants do in the field depends on the community projects Rebuilding Together New York City is working on. During Shawn’s training, it included the repair and demolition of homes that had been flooded or abandoned as a result of Hurricane Sandy. Shawn and the other participants learned to properly remove materials still in salvageable condition. They got hands-on experience with safety practices, landscaping, insulation, drywall, taping, mudding, and recognizing structural damage. After spending many years without a clear direction, Shawn has transformed his life with the support of Rebuilding Together New York City. 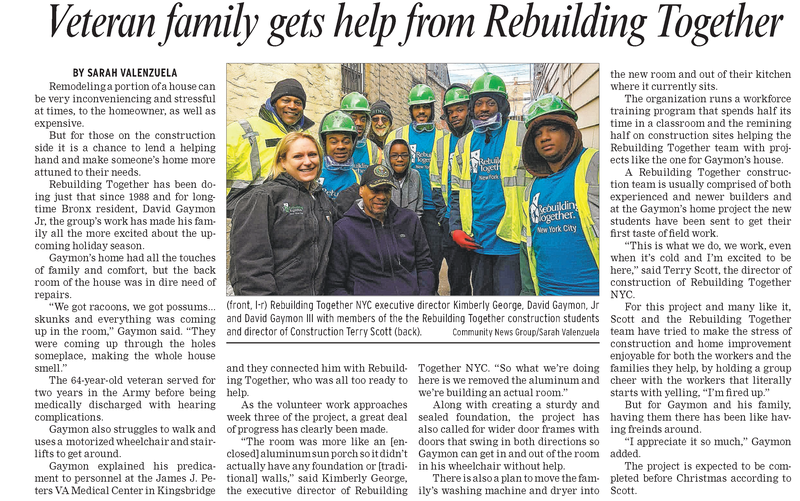 Want to read more about Rebuilding Together?